Top Stamford criminal defense lawyers would agree that a charge of strangulation in any degree can have a significant impact upon your future and very serious consequences. Strangulation is often a crime that is associated with domestic violence arrests. However, of course it can be charged as a nondomestic violence offense also. The common theme among all strangulation crimes is restraining someone by the neck. The degree or level of the strangulation crime varies depending on the mental intent of the actor and the injury sustained by the victim. Strangulation starts off as a misdemeanor level offense but can also be charged as a class C felony level offense under certain circumstances which we will discuss at greater length below. Strangulation is a serious crime and a conviction for this offense could carry significant jail time, hefty fines and lengthy periods of probation. When you are charged with the domestic violence crime of strangulation you then become ensnared in the domestic violence court system. You need a top Stamford domestic violence defense attorney to investigate the circumstances surrounding your arrest find the most effective way to combat the allegations against you and explore every possible alternative to get the charges dismissed. At the Law Offices of Allan F. Friedman we have empathy for the tough situation that you are faced with and we realize that you are undergoing a lot of uncertainly, stress and frustration. Strangulation in Connecticut has three different levels ranging from a misdemeanor up to a class C felony. In this section we will discuss the statutory elements of the crime itself and some possible defense strategies which present themselves to defending these allegations. You recklessly restrain another by the neck and by so acting impede the victim’s ability to breath or the flow of blood. This crime is punishable by up to one year in jail, a fine and probation. You intentionally restrain another by the neck and do so with the intent to impede the victim’s ability to breath or the flow of blood. This crime is punishable by up to five years in jail, a fine and probation. You commit strangulation in the 2nd degree while doing so you either a) using a dangerous instrument; b) causes serious physical injury or you c) had previously been convicted of a charge of Strangulation in the 2nd degree. This crime is punishable by up to ten years in jail, a fine and probation and is an obviously very serious offense for which you need to retain a top Stamford criminal defense attorney. The Strangulation statute has a statutory preclusion against being convicted for the same incident or offense for a combination of strangulation and assault or unlawful restraint. The reason for this prohibition is because when they drafted the strangulation statues which were primarily aimed at domestic violence offenses they realized that the act of strangulation was essentially also an assault and an unlawful restraint at the same time. The Legislature did not intend to add to already lengthy jail time exposure in crafting the strangulation statutes by allowing the State to charge someone with 3 offenses for the same action. However, the statute allows the Police to charge you and the State’s Attorney to prosecute you for all three offenses simultaneously for the same act. I guess this is kind of like throwing all the garbage up against the wall and seeing which charge sticks the best. This is why in so many situations we see clients charged in minor domestic violence offenses with a long list of offenses including strangulation, unlawful restraint and assault including others as well such as breach of peace, etc. But you can only be convicted with one of strangulation OR assault and unlawful restraint not both. Any violent assault, crime of threatening or stalking behavior that takes place between parties that fall into one of these groups would be treated as a domestic violence crime. It is important to understand that there is no such thing as a crime of “domestic violence” in the State of Connecticut. Rather, whatever crime you are charged with is treated as domestic violence offence if it occurred between parties included in the list above because the offense is a crime of violence and secondly because it involved people related under the definition of a “family” as set forth by the statute. The distinction is critical as domestic violence crimes are then handled on a separate docket and then they are handled with additional protections and procedural difficulties than in normal criminal cases which makes resolving them more complicated. In almost every instance when your case is classified as a domestic violence matter it will carry more procedural hurdle including orders of protection and conditions of release. So, if you have been charged with strangulation call a top Stamford domestic violence defense attorney at the Law Offices of Allan F. Friedman today. If you are arrested for the charge of strangulation for a domestic violence offense you will be issued a temporary order of protection by the Police and also required to appear in Court the next morning after your arrest. It would be a great idea to do a google search and retain a Stamford domestic violence defense attorney to go with you to the arraignment and give you advice and representation. During the arraignment the Court is going to make some important decisions which will have a lasting impact on your life during the duration of the case which could take several months to resolve. When you get to Court the first step is a meeting with a family relations officer. The purpose is to decide what kind of conditions of release are needed and to get your input on what kind of criminal orders of protection the Court will be entering and to provide you with some basic information about the process of a domestic violence case. While you are speaking with Family relations keep in mind that just as with a Police officer everything you tell them could be used against you. Thus, I always recommend that clients do not discuss any details of the alleged incident itself. The best solution would be to have a Stamford domestic violence defense lawyer sitting by your side during the interview to protect your rights. The Family Relations Officer’s task is to go over all the documents in the case file and then advise the Court about what kind of conditions of release it should impose and more importantly what type of orders of protection are needed in your case. In the case of strangulation most likely the Court is going to impose some variety of criminal order of protection while the case is pending. These orders provide protection to alleged victims and they vary in level or degree based upon the circumstances of each individual case. Criminal orders of protection come in three different levels. The least invasive and entry level order is known as a “partial” order which will impose a court order that you do not harass, assault or annoy the other party while the case is pending. The next level of criminal order of protection is known as the “full” order a/k/a residential “stay away” criminal protective order which has all the same conditions as the “partial” order while allowing you to engage in normal contact with the victim but which prevents you from entering the home where the victim resides. The final type of criminal protective order is the “full no contact” criminal protective order which literally means do not have any contact with the victim. It must be noted that any violation of a criminal order of protection no matter how trivial is a felony. I have over the course of my 25 years of practice in the field of domestic violence defense seen many clients who had solid cases which the State could never prove at trial have to accept a plea negotiation because they later went out and contacted the victim in violation of a criminal order of protection. If you send a text message or email in violation of a criminal order of protection you are committing a felony and placing yourself in a very difficult situation. If for some reason you feel that the criminal order of protection should be modified then you need to retain a Stamford domestic violence defense attorney to make an application to the Court to seek a modification to modify the criminal order of protection. The orders remain in effect until the Court modifies them. The victim can’t authorize you to break a criminal order of protection. In many cases involving strangulation the Court is going to impose as part of its conditions of release a referral for some form of treatment at “AIC.” This is now a condition of your continued release on bond and a Court order. The Courts have become very treatment orientated in their handling of domestic violence cases. Research has shown that treatment for anger management and substance abuse have a greater impact on prevention of domestic violence and recidivism than incarceration and criminal records. The Courts are investing up to $20,000,000 per year in Connecticut on programs run by third party providers that address these two main focus areas. The problems is that for anyone with a serious occupation or who works in New York City, as many of our clients do, attending bi-weekly day time group therapy sessions while their case is pending is not realistically feasible. If you fall into this category or simply can’t handle the course load of one of these programs in your busy schedule the good news is that a Stamford domestic violence defense attorney can make a motion to modify the conditions of your release too substitute the Court mandated program for more convenient and flexible therapy with a private counselor or therapist. Despite my recommendations that clients retain counsel to represent them during the arraignment proceedings for strangulation the reality is that given the very limited amount of time between the arrest and the arraignment in Court most clients do not have an opportunity to retain counsel in such short notice. If you just had your arraignment and those dreaded criminal orders of protection have already entered against you there is plenty of time to retain a Stamford domestic violence crimes defense lawyer and make an application to modify the criminal orders of protection that the Court imposed and also any conditions of release as needed. Feel free to Contact the Law Offices of Allan F. Friedman today for a free consultation and learn about how we can defend you against the charge of strangulation and get the charges dismissed or reduced and resolve your entire case. Many top Stamford criminal defense lawyers will agree a strangulation allegation has many directions towards a successful resolution. My objective is always to obtain a dismissal of all charges that leaves the client without a criminal record. The formula for organizing a winning defense strategy means working harder and smarter than the Police and knowing my client and the facts of the case thoroughly. It starts with a detailed initial client intake interview, to listen carefully to your version of the facts and get to know you. Next we will scrutinize the Police report and the victim’s statements with an eye towards identifying every error and inconsistency. In many cases we can move to exclude evidence if there has been a violation of your Constitutional rights. If the facts support it there may be a need to hire a private investigator to dig a little deeper into the past history of the victim. Once we have carefully gone over all of this background information and carefully considered every available defense option available, we will be in a position to advise you concerning the most effective defense strategy possible with the objective of having the charges against you dismissed. I have seen that in many allegations of strangulation the accused client was actually only attempting to fend off an aggressor who was coming at him raining down fist strikes and blows and the act of restraining the victim by holding the victim by the neck was a defensive act to stop the attack. In cases of domestic violence the Police often make what is known as a “dual arrest” in Connecticut. This is a common practice where they do not take the time to sort out who was the primary aggressor and instead just arrest both parties involved and let the Court deal with it. 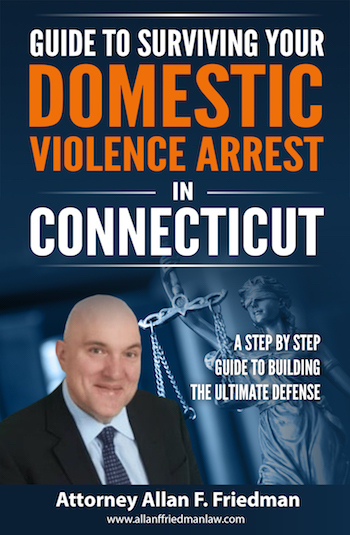 Statistics show that in Connecticut up to 30% of arrests for domestic violence result in dual arrests. Self -defense is a valid defense to an allegation of strangulation. If you have been charged with strangulation you will be best served to select an attorney that has a primary focus defending domestic violence matters because domestic violence matters employ many defense methods that are unique to the field of domestic violence crimes law. If you are charged with strangulation in the 3rd degree and the injury is minor then a possible solution could be taking a course of anger management therapy which could lead to a dismissal of the charges. Many strangulation 3rd domestic violence cases have a successful disposition with some form of therapy or treatment and a dismissal agreed upon through discussions with family relations and the State’s Attorney. In cases of strangulation in the 2nd degree, there are alternative methods available which also lead to a dismissal of the charges. In domestic violence matters they have their own diversionary program known as the Family Violence Education Program is a diversionary program. Basically this is a 10 week educational program that has a class that meets once a week for 10 weeks. If admitted to the program successful completion would result in a dismissal of all charges. Finally, in more difficult cases in which we face harsh allegations or a persistent victim that opposes participation in a diversionary program we are not afraid to stand up against the State. Where the facts warrant it we are prepared to defend your case at trial when appropriate. There are many methods of defending strangulation charges which go beyond the scope of this brief introductory web page and which may apply to your case. There is no substitute for a free initial consultation where I can review all of the specific details of your case and provide you with more individualized recommendations. Let Us Fight Your Strangulation Charge! We provide free initial consultations. I have 25 years of experience defending criminal charges throughout the State of Connecticut. During your initial consultation we will go over your goals of the representation which are usually a dismissal or a reduction of the charges and go over any special concerns that you may have. Hiring an experienced Stamford domestic violence attorney can make the difference in having your case dismissed or reduced down to a lesser charge. If you have been arrested for strangulation in Greenwich, Stamford, Norwalk, Darien, New Canaan, Cos Cob, Fairfield, Westport, Wilton, Weston, Bridgeport and throughout the County of Fairfield do not hesitate to contact the Law Offices of Allan F. Friedman. We work on a flat fee basis and our rates are reasonable. We offer payments plans as needed. Call Attorney Friedman at 203.515.4110 to schedule your free initial consultation we are available 24/7. Or you can contact us online for a prompt response. We serve clients throughout Connecticut including those in the following localities: Fairfield County including Bethel, Bridgeport, Brookfield, Danbury, Darien, Greenwich, Monroe, New Canaan, New Fairfield, Newtown, Norwalk, Ridgefield, Sandy Hook, Shelton, Stamford, Stratford, Trumbull, Weston, Westport, and Wilton.